Above: Photo of Grover "Dean" Barlow, lead singer of The Crickets (1953-54). 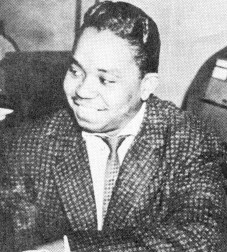 As a solo on the Jay-Dee label, Dean had hits with "I'll String Along With You" (1954) and "Forever" (1955). Dean returned as lead singer of The Bachelors (1956) and The Montereys (1957), both groups including some previous members of The Crickets. The Crickets were inducted into the UGHA Hall Of Fame on 4/29/99. 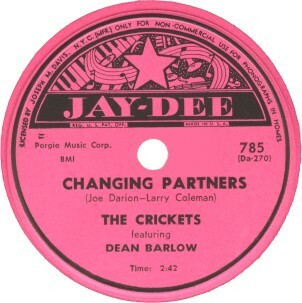 Above: Label image for "Changing Partners" by The Crickets, featuring Dean Barlow. This song was released by Patti Page earlier in 1953 and was a big hit for her. Note the pink label... it was also released on 78 rpm with a yellow label. On this record, the group consisted of Dean Barlow (lead tenor), Robert Bynum (first tenor), William Lindsay (second tenor), and Joe "Ditto" Dias (bass). Click on an option below to listen to "Changing Partners" by The Crickets using RealPlayer.